The fifth song in the grands chants is unique to Douce 308 and is thus transmitted to us without any melody. However, its versification makes it possible to sing it to the tune of a song with a similar poetic structure. 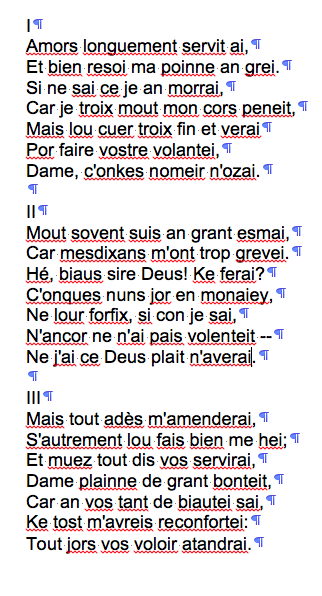 First let me give the text and translation of the song (again, my thanks for Helen Swift for discussion by email of various tricky places in the text and translation). I have served Love for a long time and received my pain most willingly. And so I don’t know whether I shall die of it, since I find my body is greatly struggling, but I find my heart sound and true to do your will, lady, whom I would never dare name to anyone. Very often I am in great distress, because gossips have wounded me so much. Hey, dear Lord God! What shall I do? That never, not once, do I pay them back for it or forfeit them, as I know how to, nor, moreover, do I have the wish to do so–I neither have it nor will I have it, unless it pleases God. But constantly, without ceasing, I will improve myself, if it’s the case that the group of them really hates me; and mutely will I always serve you, lady full of great goodness, because I know that in you is so much beauty that I shall soon be comforted again: every day I await your will. 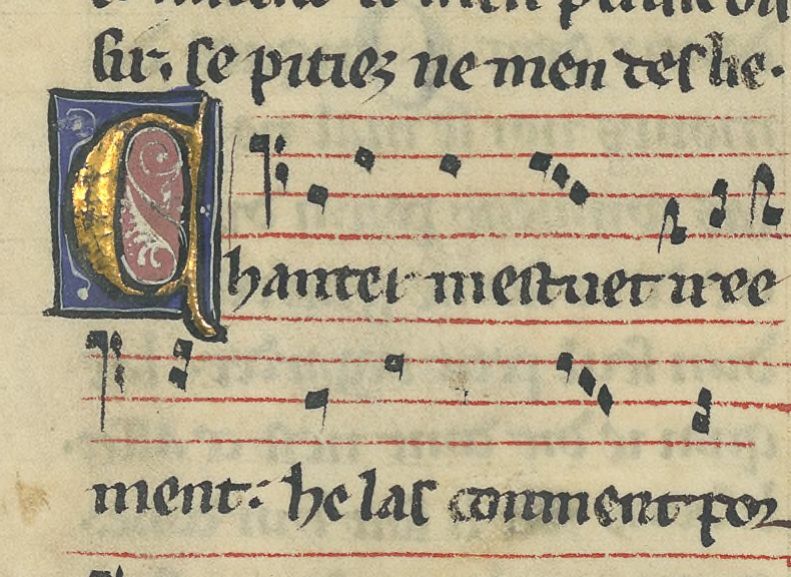 The melody that will work is that for Chanter m’estuet ireement (RS 687), which is attributed to Gace Brulé in the trouvère manuscripts KNPX, as well as appearing anonymously in L and V (for unscrambling of these sigla, see this page). I’ve transcribed the pitches from N (supplying the erased third pitch in line 2 — see MS image above — from the cognate melody in line 4; click here to go the the manuscript image). 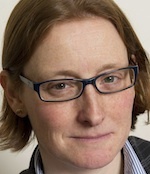 Gace’s poem (if it is by Gace — the most recent editor, Samuel N. Rosenberg, doubts that it is because of its looseness in rhyme and grammar), like the anonymous one in Douce 308, invokes gossips in the second stanza and recounts the pain of love. This is not unusual, however, and I would not like to suggest at all that this was a contrafact of the Gace song in the Middle Ages. But it is now! 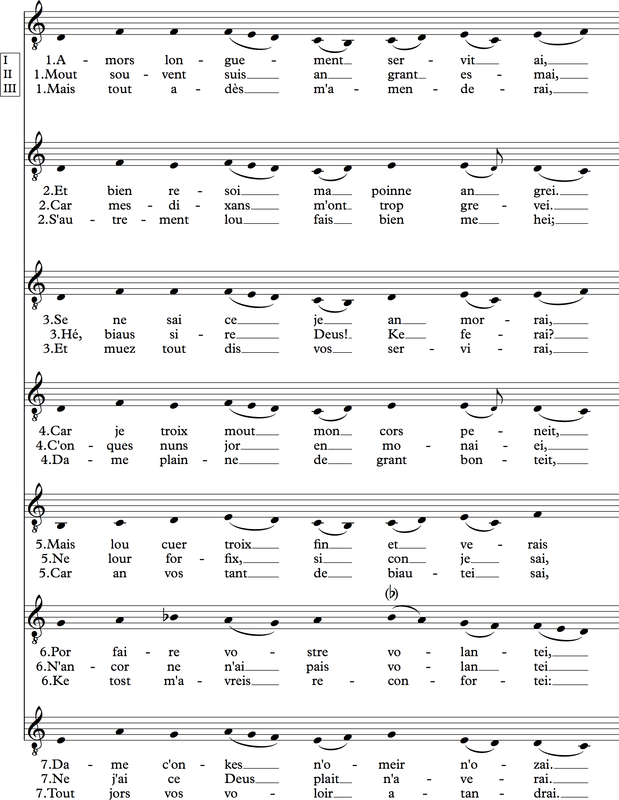 A score follows; for a pdf, click on the following linke: RS687 – Full Score.